Enchanting, privately owned grade II listed, Georgian home. Sandhill House is the perfect countryside retreat to escape to and enjoy exclusive B&B accommodation in the heart of the breathtaking Tamar Valley. Set in an Area of Outstanding Natural Beauty and World Heritage Site, this select B&B Cornwall is the ideal gateway to explore the fantastic natural environment of the Tamar Valley and its world changing heritage, Dartmoor National Park, Bodmin Moor and historic Naval city of Plymouth. In addition Sir Francis Drake’s hometown, Tavistock, is less 10 minutes drive and both the rugged north and sandy south coasts being just 30-40 minutes away. It is also ideal for exploring several National Trust properties, or for business if you prefer to avoid the big hotel chains. Please note that we do have our dear dogs here, though you are only likely to meet Fudge. To book please call Mary on 07713 077877 or landline below..
A wonderful reception as if we were long lost friends. A beautiful setting in a hidden away part of Cornwall. Access to so many hidden treasures. I brought a dog with me and the owners gave as much care and attention to the dog as they did to me. It was a superb place to stay. 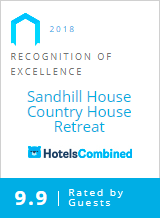 Sandhill House is the perfect countryside retreat to escape and enjoy exclusive accommodation in the heart of the breathtaking and ‘hidden’ Tamar Valley in Cornwall. Set in an Area of Outstanding Natural Beauty and World Heritage Site, this select B&B is the ideal gateway to explore the unspoilt, natural environment of the Tamar Valley and its world changing heritage. © Copyright Sandhill House Country Retreat, All rights reserved.